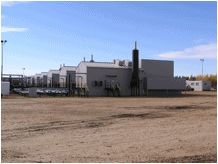 Fort Energy Corporation, a subsidiary of Trident Exploration Corporation in Alberta, Canada, first approached Noise Solutions in 2005, to determine the best noise control and environmental solution for their massive Sandhills Gas Plant generating thousands of horsepower near Fort Assiniboine in Alberta. Trident Exploration is renowned for its leading-edge environmentally conscious techniques, and it was important that the operation maintained its efficiency and reputation as an environmental innovator. Understanding that prolonged exposure to industrial noise, like that emitted from the Sandhills site, could potentially cause discontent and detrimental health effects to nearby residents, Trident contacted Noise Solutions to address the issue. As a Western-Canada based company engaging in the exploration and development of Natural Gas from Coal, Trident and Noise Solutions were committed to going above and beyond the Energy and Utilities Board (now the Alberta Energy Regulator) compliance regulations and set a new standard of Noise Control in the Oil and Gas Industry. The Sandhills Site proved to be unique, as its vast size and number of noise sources were somewhat of a challenge to deal with. Through Noise Solutions unwavering determination to provide unsurpassed service, quality and results, they exceeded Trident’s laudable objectives. 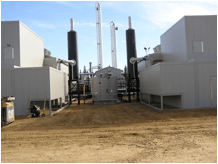 What was accomplished at the Sandhills Gas Plant was not only unparalleled noise attenuation, but it also raised the bar for what is truly possible in Noise Control. 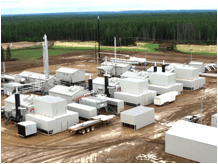 At the time of the Noise Solutions installation, there were five separate compressor units on site, each with a CAT3516TALE engine at 1340 horse power and an Air-X-Hemphill 144 ZF Cooler. Adding further noise complications were the Refrige and Amine Coolers. In order to fully attenuate all noise sources and frequencies, Noise Solutions highest-performing equipment was tailored to specifically meet the client’s needs. Horizontal Inlet and Outlet Silencers proved to be more than efficient at diminishing the excess cooler noise. For the two additional coolers, Inlet and Outlet Silencers were also used. This combination of noise reduction equipment and design customizations achieved outstanding results. Maintaining open and honest communication with clients is a top priority for Noise Solutions. During the six-month project, which completed in June 2006, Noise Solutions worked closely with Trident to ensure all objectives were met and the results were extraordinary. So much so, that the Sandhills site is often showcased to other companies as what can be achieved in noise attenuation. Today, the site’s overall noise production is comparative to a quiet neighborhood and relationships with the Alberta Energy Regulator and nearby residents is sound. The entire process between Noise Solutions and Trident was executed with world-class results, proving Noise Solutions’ innovation and ingenuity, while setting a new standard in noise control for the entire oil and gas industry.